I was recently looking at some stuff online about the Skripal case and came across this guy and his site through a link from an article. The article was on a guy who also has been evidently poisoned by Russia (biotoxin this time) in France but they make reference to Russia Insider as they wrote about the case evidently. Anyway, the Inside Russia thing intrigued me because the guy who started the site and still runs it is from my neck of the woods (Greenwich Connecticut) on the gold coast as we call it here. 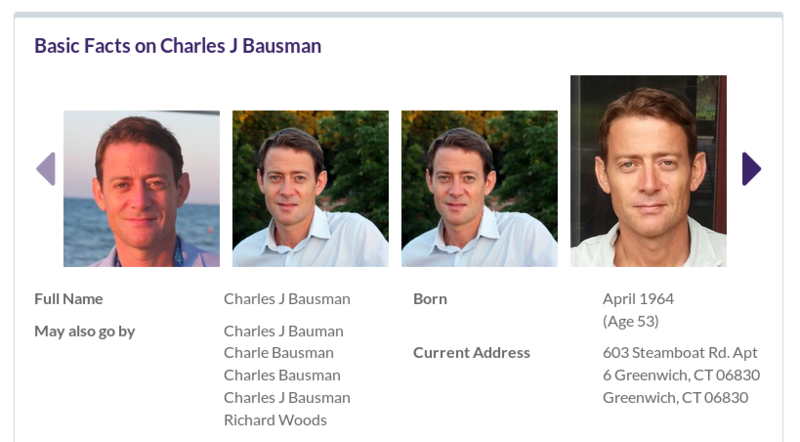 Evidently Charles J. Bausman, a 53 year old American (ex… Patriot?) 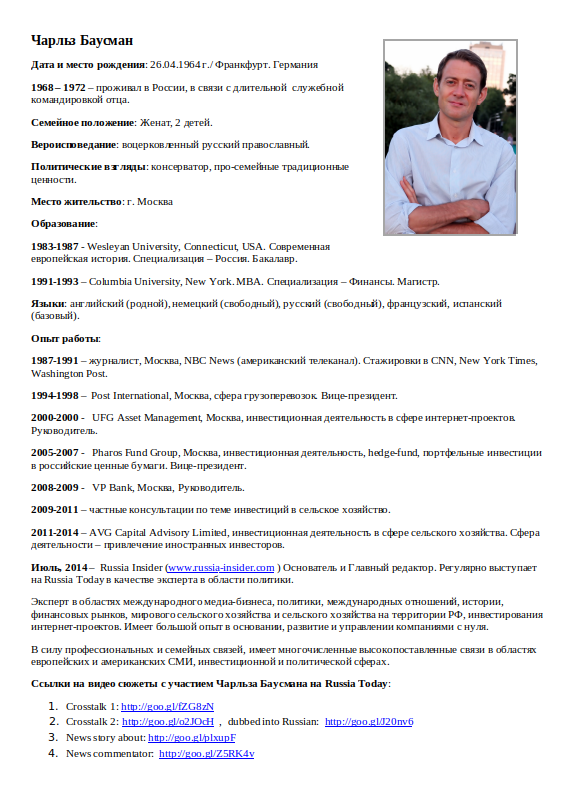 who now evidently lives in Russia, runs the propaganda site known as “Inside-Russia” and works in finance, or agro-business finance. At any rate, the site is quite the nest of pro Putin propagandist and antisemitism. In looking around I had to wonder just how a kid from Connecticut who went to a swank prep school here and Wesleyan University (somewhere I went for a summer) ended up a Russian propagandist front and allied with a couple oligarchs close to the Kremlin? Bausman say’s he was born in Germany in 64 and travelled a lot including a long stint in Russia (Moscow) when his father was on a “long business trip” which is to say that his father was bureau chief for the AP back in the old Sov days. John Bausman III was all over the place as an AP reporter but that time in Russia seems to have affected Charles quite a bit. I am not sure just when and how Charles became a Putin propagandist but the site he set up started in August 2014 and has been gaining momentum ever since. In doing all the background on Charles I had to wonder about his father, which, I could not find too much on other than his obit’s online. 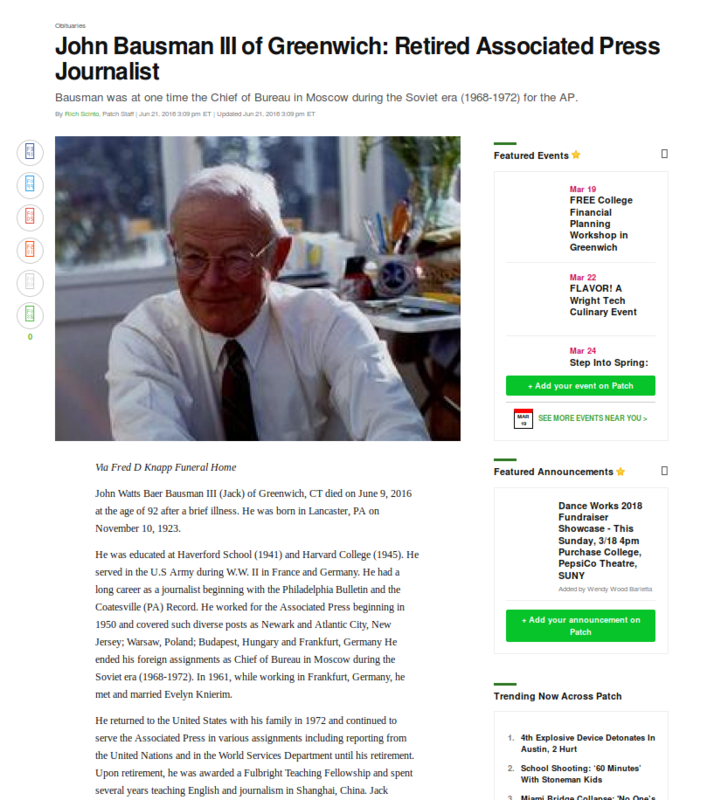 I have to wonder just how his father felt about his son’s Soviet/Putin leanings after he started the site, which by the way, was registered with the house in Greenwich where they Bausman’s lived in Greenwich CT. As John was older, perhaps he did not really get to see the site or know much about it. Maybe he did and approved of his son’s leanings? I am not sure, but suffice to say that it may be their travels in the Baltics during the old days might have affected his young son profoundly. I can imagine that if he wasn’t home schooled, he may have been indoctrinated by the Soviet state in some way in his youth. I just don’t really know, but, the other thing that kinda crossed my mind again and again was what were John’s leanings on all this? Like father like son? At any rate, the son is an out and out Putin “Praetorian” as the book “Putin’s Praetorians” claims and evidently Charles could not resist writing a review of it on Amazon. 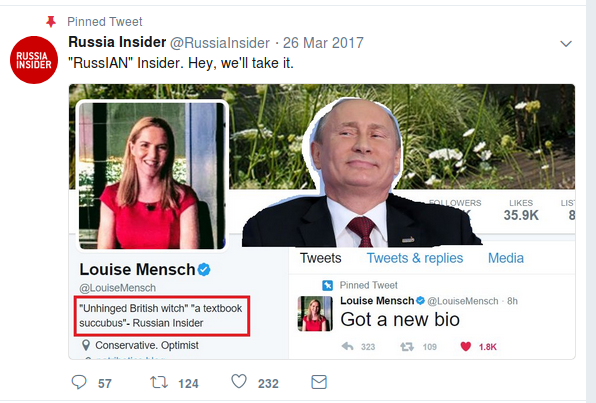 In fact Charles enjoys his titles as even on his Twitter feed, he boasts of being one of Louise Mensch’s “Russian Trolls” which is I have to say Amusing as I myself am blocked by her because she is an idiot hanger on of the jester. Anyway, if not a troll, what Charles is is, a propagandist tool. Or, I should really say a “would be” tool because he is not trying to hide his identity and is fairly open with his propaganda claptrap he is trying to sell the the conspiracy masses. His site is a “collective” of writers he says, but in looking at them only a few are named and one of them, Anatoly Karlin, is a straight out conspiracy Nazi connected apparatchik for Putin. Now, on the account of this site being akin to the IRA, well, no that is not the case. However, the Twitter feed and the content is pretty popular and has been rising over the last couple years, peaking in January this year as everything went to hell concerning the RussiaGate story. I would not be surprised if anyone were to do some more mining and find that accounts proximal to the IRA Twitter accounts might have this on their feeds as well. While all of this spin and energy has been building though, Charles has been hungry for funds to continue his work, even though he is some kind of finance wizard according to all his degree work and jobs over the years with Russian banks and the like. 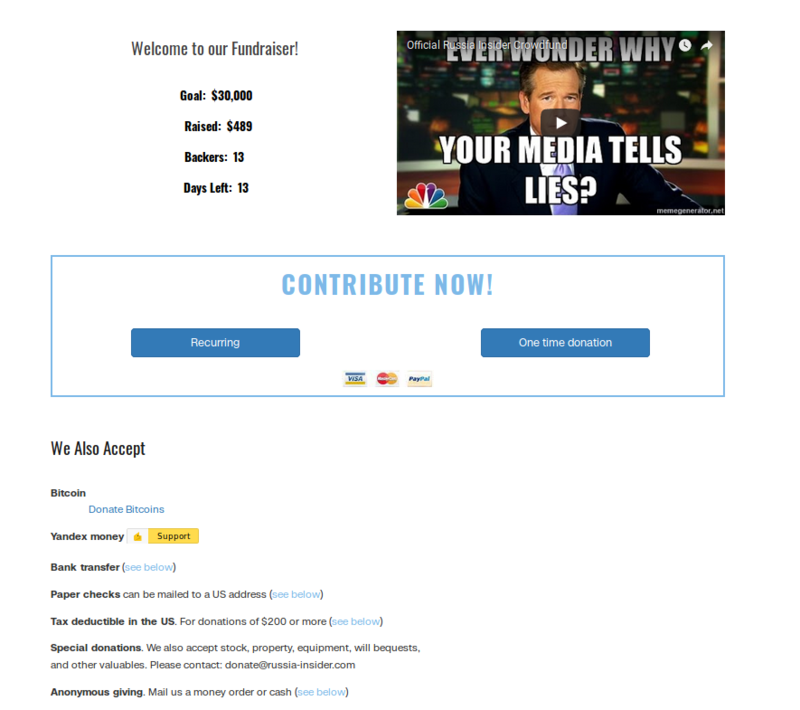 You can donate to Russia-Insider on their site and they take bitcoin and paypal as well as a couple other more obscure payment schemes. Evidently “citizen journalism” costs the big bucks! While his bitcoin wallet has had no transactions at all, I have to wonder just who is paying for his site and activities. 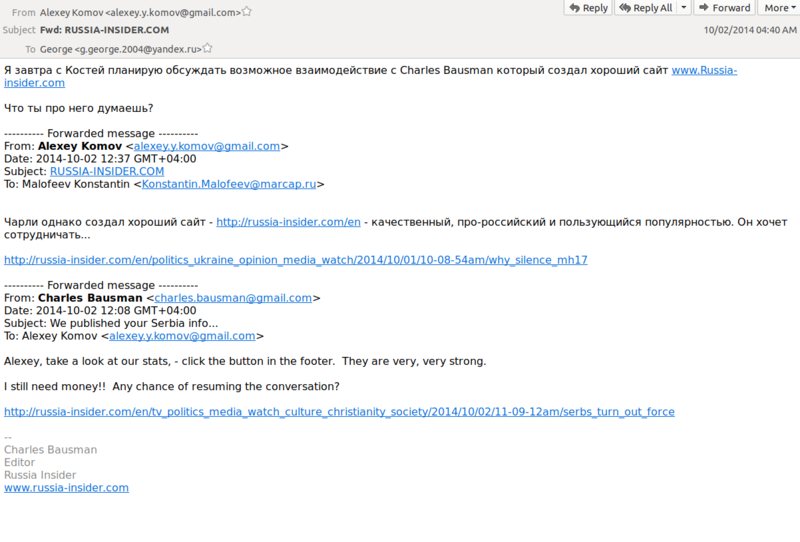 In 2014, just after launching the site he exhorted Alexey Komov and Konstantin Malofeev that “I still need money!” which can be seen in the screen shots above from emails that I got from Shaltai Boltai’s dump of Malofeev’s email spool. I went through all seven hundred plus emails and found no more than those you see above. 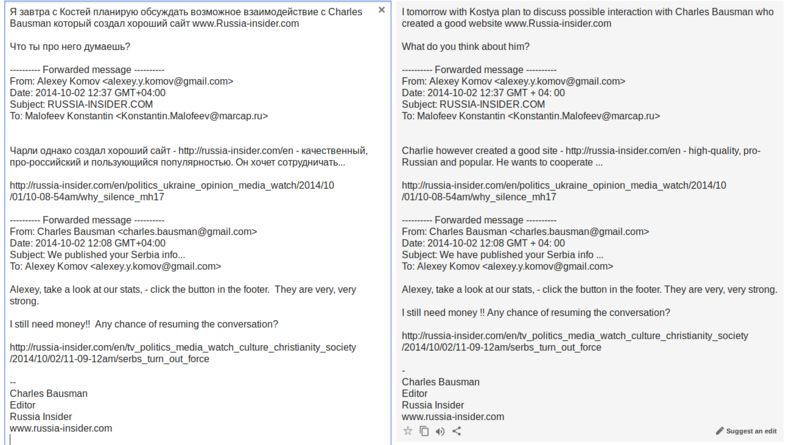 So it is unclear whether or not the Kremlin connected Komov and Malofeev ponied up money but they seemed amenable to it in the emails that I saw. 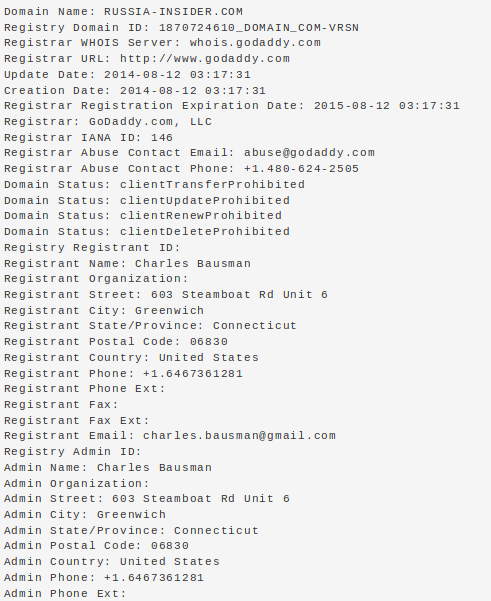 I am going to assume that since the site is still up and that Bausman has added a slew of other domains, he has more plans and that he also got the funding to start. Only time will tell if he moves further and activates the other sites that he owns. As you can see, if he had it his way, perhaps Russia-Insider would not be the only “insider” site that he could be spreading propaganda with. It is interesting to note that the countries he has chosen to create domains for are all ones that the Russian state would be interested in targeting propaganda at. I am not really sure what the “Cadmus” site would be all about but if you know your history, Cadmus was a slayer of monsters in the Greek pantheon. So far none of these sites has ever had content on them so there is nothing to see.. yet. Maybe if Charles gets his money he will someday have a media empire eh? Overall, this guy is no clear and present danger but he is one of the lights in the constellation that is RU apologist propaganda. He isn’t RT or Sputnik just yet but he has ambitions to be I think. What really just makes me wonder is, as I said at the top, how does this kid go from US citizen to Russian propagandist? So many unanswered questions on this one for me. Was his father enamored with the Soviet state in the 60’s and 70’s? I mean it was no pleasure dome out there at that time no matter what the Soviet state would like you to think. Of course some might see Wesleyan and think that the left leaning’s of the school would only entice a youth to become more liberal, but jeez, I mean this guy is full on nutbaggy! Also, this guy still has everything listed in America as ownership goes! The Russia-Insider site before being set to privacy still has his parents place listed as the address! Choose a country dude. Well, that’s about it on this one. Just a little heads up on this guy and a bit of background. I kind of have a yen to drive down to Greenwich and visit the Russia-Insider HQ just for shits and giggles. If anyone else has any tidbits they care to drop on me use the Protonmail acct. Until next time, keep watching these whacknuts.